Another day, another ridiculous excuse for a miner not responding to me within 5 seconds when I call. It didn't take long to realize that Patric Catani was a newbie when it came to the New Order. In my view, it doesn't matter how long you've played EVE. I have more respect for a day-old newbie who's acquired total familiarity with the Code than a 10-year vet who's clueless. 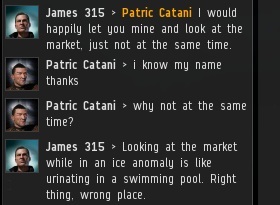 After I forced Patric to retreat from the ice anomaly, he invited me to a convo. I assumed I would be treated to some pleasant conversation, if not an outright apology. But it was an ambush, and he immediately sought to put me on the defensive. I don't use metaphors and similies just to make myself look cool--I look cool enough as is. Rather, I create word pictures for the miners I educate, because they stick in a miner's mind long after our session. Strange, but true: Even in this day and age, there are still people who haven't read the Code. 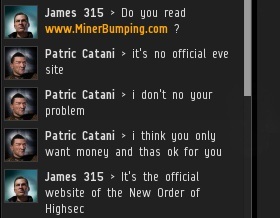 CCP doesn't need to create a website for it to be an official EVE publication. You won't be banned for violating the Code, but bans aren't the only things that can prevent you from mining. You know, it's funny. Everyone looks down on "yes-men", or so they claim. But they get a different attitude the moment you start telling them hard truths instead of what they want to hear. More often than not, it is your friend--not your enemy--who tells you the things you don't want to hear. Carebears are the exception to the rule, because they'll say just about anything when they get angry. Ignore them. 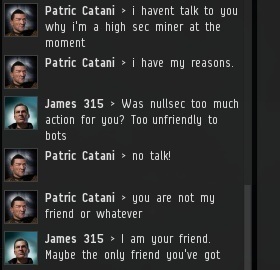 You would be amazed how quickly highsec miners will confess their crimes if you establish a rapport them, as I do. 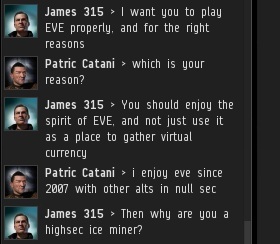 Patric admitted that he had been a nullsec resident since 2007. He therefore had no business becoming a highsec ice miner. Patric realized his mistake. 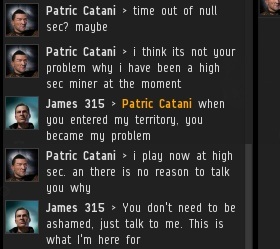 Then he clammed up and refused to explain what had happened to transform him from a proper nullsec miner into an illegal carebear. The conversation that began with Patric asking me "what's your problem?" was now an intervention aimed at discovering Patric's problem. He didn't like it, so he left. Though I am a friend to everyone who mines in highsec, I am also their surrogate parent--the Father of the New Order. Sometimes a parent rewards his children, such as giving them credit for purchasing a mining permit. Other times punishment--such as bumping or ship destruction--is called for. A good parent does not abdicate his responsibilities in an attempt to curry favor with his children. I sincerely hope Patric understands that what I did was out of love, not malice. Pfft.. just another wannabe. Ive been mining in Halaima for days just waiting for you or any of your flock of retards to drop by. Nada. Zippola. Nice fiction ya have going here but if anyone actually buys into this crap they are bigger retards than you are. My home system is Vattuolen and I have never seen you show your mug there ever. You are a waste of skin. You can shove your code. Stop breathing my air. Tell me how you are a regular visitor of this webpage and not an angry miner(patric catani) who just wanted to cry a little in the internet. If you actually are a big fan and reader of this site you will have noticed the "The rumble in Vattuolen" Part 1-4 where pubbies like you tried to gank james, and failed bigtime. The new oder is everywhere. Keep that in mind. I normally like reading MinerBumping but this article was just creepy and gross, and not because of Patric. Don't become what you hate, James. How interesting that you mention that you have been mining in Halaima. 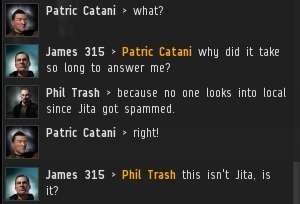 Now, I am only one Knight but I have destroyed 126,500,000 ISK worth of bot aspirant mining ships in Halaima this week alone. Not to mention the 1.3 billion ISK worth of vaporized illegal mine-boats I destroyed right next door in Kamio. Recorded facts are what count. Not anonymous insults. @Selina the New Order is not everywhere, bring your crew to Provi we need more reds to shoot. Lol if you're null sec than the Earth is flat... By the way, this is the New Order of HIGH SEC, if you missed it. yes i said the new order is everywhere and that is true. 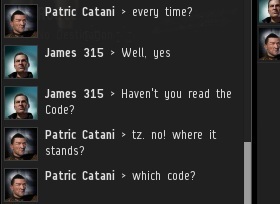 yes we enforce the code only in highsec, still our agents and knights and also supporters in any way, live in lowsec, nullsec, wormholespace, too. I am James 316. Please take careful note of the name.. James 3:16. You are retards, every last one of you. 315 says 'My Stabber has never needed ammo"... of course not, he has stooges like you lining up to do his cyber bullying for him. You are the ones taking the risk, not him. 315 is a coward of the worst sort and you are all the stupider for letting him lead you around by the nose. Oooo.. the big bad Internet pirate. James 3:16 says "the time is now brothers. Tell CCP how you feel about this brand of cyber-terorism. Put your accounts on the line. His account or yours. Tell them, and be free." Where your "brothers" told CCP how they felt about bumping and CCP said, "Thumbs up Bumbers!" No New Order Agent or Knight's account is "on the line." More often than not, its the miners who put their accounts at risk of bans by making RL death threats over a video game. You're lying Anon. Your name is Bobbins. Hmmm, I don't remember CCP, EVE or dirty bot-aspirant miners being mentioned in the Bible specifically at John 3:16... But what do I know, I'm only a seminary student. John 3:16 "For where envying and strife is, there is confusion and every evil work." It's like James 315 is trying to free poor souls from the Matrix's slavery. 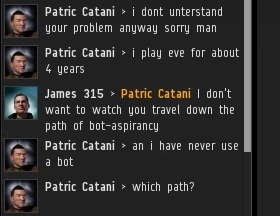 And yet many of them hate him...I guess getting EVE is not required to "play" it. Using a game by exploiting Concord Mechanics? That is advertised is it? Abusing mechanics in a game to intentionally deprive other players of their enjoyment? That is advertised is it? James 3:16 says "Lift the yoke, tell CCP you will not stand for cyber bullies exploiting game mechanics to leave you with no way to defend yourself. zero chance to retaliate without engaging in game exploits. Tell CCP, put your money where your mouth is.. put your account on the line and tell them straight up, his account or mine. Tell them, and be free." The literal answer to your questions is, unequivocally, "YES." CCP markets Eve, in fact gets its biggest boost in subscriptions when (a) epic nullsec battles take place and (b) someone pulls off a major heist at the expense of many many other players. 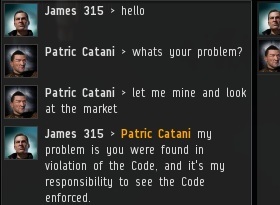 CCP wants conflict in every part of the game. They work at making new conflict (like the recent removing of unlimited ice). Good grief, the name of the game is Everybody Vs. Everybody. What you call "exploit" is not called an exploit by CCP. It is using the rules built into the sandbox. As for your call for people to unsub if carebears don't get your way? 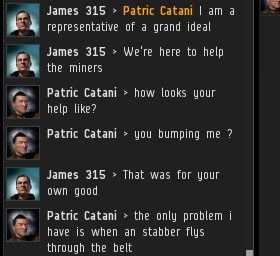 CCP knows where its bread is buttered. The butter comes from people like me who were about to unsub from this crappy, grindy, horrible PvE game until the light of the New Order shinned into my heart to give me new life. Now instead of unsubbing one account, I have 3 paid accounts. Praise James 315! Please Anonymous poster, give me your in game character name. I want to let this little light of mine shine. James 3:16 says: I already have. Your IQ is plummeting as we speak, I see. James 3:16 says "You play your way, WE will play ours." The funniest part about all of this is that we're making bank mining hi-sec, regardless of the bumping going on in ice-fields. If I ever need a good laugh at the expense of someone else, I'll go to Kamio, and see how many people I can get to trash talk the New Order of Hi-Sec. The best part is, I can do this from inside a station! James 316, I will follo u but I ned isk. PLease send to me so I can mine agin. If You get me back in orca and mack I will follow you newhere.